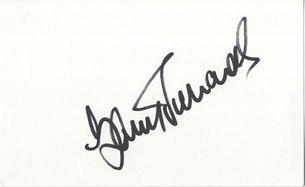 This is an In Person signed white card 5.5" x 3.5" by the legendary South Africa Test Cricketer. Barry Anderson Richards (born 21 July 1945) is a former South African batsman. A right-handed "talent of such enormous stature", Richards is considered one of South Africa's most successful cricketers. He was able to play only four Test matches ' all against Australia ' before South Africa's exclusion from the international scene in 1970. Even in that brief career, against a competitive Australian attack, Richards scored 508 runs at the high average of 72.57. Richards' contribution in that series was instrumental in the 4-0 win that South Africa inflicted on the side, captained by Bill Lawry. His first century, 140, was scored in conjunction with Graeme Pollock's 274 in a famous 103-run partnership.